Click here for "How to find us"
Longer stays get lower nightly rates. Call or email for an exact quote. Longer stays get lower nightly rates. Call or email for an exact quote. Longer stays get lower nightly rates. Call or email for an exact quote. *All nightly & weekly rates are plus tax. *Nightly rates are based on 3+ night stays. *When available, two night stays may be higher. *Holiday rates & terms vary. Please inquire for exact quote. Three night minimum stay required during PEAK SEASON. Reservations will be confirmed with a 50% deposit. Cancellations must be made 14 or more days prior to arrival date. Payment in full is due upon check-in. 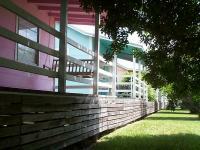 Two bedroom cottages sleep/permit up to six humans on two queens and a futon or possibly one queen, two twins and a futon. The one bedroom cottage sleeps/permits four humans on one king and a futon. 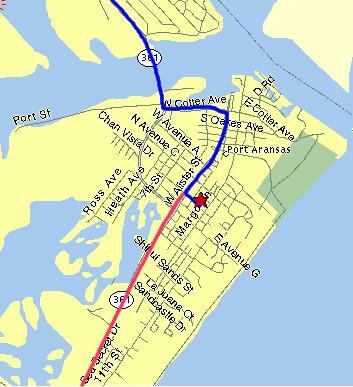 To Port Aransas from Aransas Pass: From the ferry landing, go straight on Cotter Street to the second intersection. Turn right at the 4-way stop sign onto Alister Street. Continue forward several blocks and turn left on Avenue E. We are only 2 blocks toward the beach, on your left at the corner of Avenue E & 10th St (221 E Ave E). If you will be arriving from Corpus Christi via Hwy 358 and Park Rd 22, take a left on Hwy 361 at North Padre Island and continue all the way into Port Aransas. After the second traffic light, turn right on Avenue E. We are only 2 blocks toward the beach, on your left at the corner of Avenue E & 10th St (221 E Ave E). Click here to see it on Google Maps now! ALWAYS BE SURE TO CALL IN ADVANCE OF YOUR ARRIVAL SO WE'LL BE HERE TO GREET YOU IN CASE WE WENT FISHIN' WITHOUT YOU. Y'all have a safe trip! We're looking forward to seeing you again soon! Pack up your family, favorite pet, beach towels, fishing gear, dive gear, surfboard, sailboard, boat, suntan lotion and shades and head for fun in the sun in Port Aransas.